As we move into the heat of summer, wheat harvest is wrapping up and the majority of soybeans are in the ground. About 80% of North Carolina soybeans are planted, which means 20% of our crop will be planted in June or July. Typically, planting in late June or July does not allow enough time to develop sufficient leaf area to maximize soybean yield. This is one of the main reasons double-crop and late-planted soybeans yield lower than full season beans. Strategies that lead to greater amounts of captured light during the growing season will help increase yields. Here are some considerations to keep in mind as you begin that will help increase light interception and hopefully improve yields. When planting after May, remember every day counts. 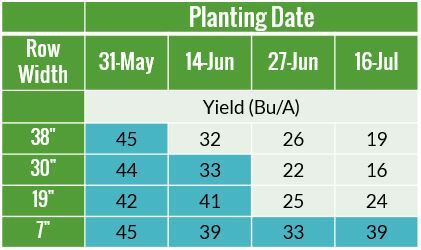 For each day not planted after mid-June soybean yields will be reduced. That means it is essential to have planting equipment and soybean seed prepared before the wheat harvest is finished so you can get right back in the field immediately following harvest to get beans planted. Ideally, the planter should be following the combine in the field on the same day. Soybean variety selection is important. Later maturity groups allow more time for growth which means yields are reduced less in these varieties. Choose as late of a maturity group as possible that will still mature before the first frost. Also, review variety test data to determine which varieties perform best in a late-planted situation. Row spacing is also an important consideration. Narrowing row spacing results in quicker canopy closure which increases leaf area and allows the beans to capture more sunlight. In addition, quicker canopy closure leads to greater weed suppression. 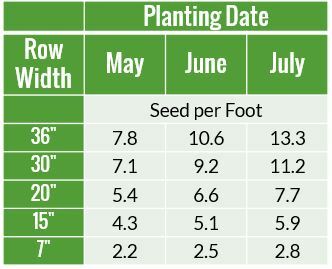 Row spacing less than 30” is recommended for late-planted beans. Effect of row spacing and planting date on soybean yield. Blue cells are where row middles were lapped, resulting in the highest yields. Data from Dr. Jim Dunphy. Soybeans planted late need more seeds per acre to maximize profit, compared to full-season soybeans. Late-planted soybeans have less time to develop nodes and higher plant densities help achieve canopy closure and help compensate for the shorted growing conditions. Seeding rate targets for late planted beans should be between 180,000 to 200,000 seeds per acre. Suggested soybean plant populations for North Carolina. Recommendations from Dr. Jim Dunphy. Late planting does not alter the need for weed, insect, or disease control but because yields are typically lower, it is important to manage inputs carefully. Since soils are typically drier for June or July planting, fungicide seed treatments are not commonly needed. A smaller canopy means less tolerance to defoliating insects so it’s important to scout for these. Late-planted beans may also be more prone to damage from corn earworms and stinkbugs as their maturity coincides with the movement of these insects from other crops. Regular scouting will help determine what pests are present and if levels are at a threshold where treatment is profitable. Dunphy, E.J. 2014. “Soybean Plant Decisions”. NC Soybean Production Course. North Carolina State University, Raleigh, NC. Lecture. Holshouser, D.L. 2014. Double cropping soybeans in Virginia. CSES-102NP. Virginia Polytechnic Institute and State University, Blacksburg, Va.